The Department of Anaesthesia at Dr. Jeyasekharan Hospital forms an integral part of the surgical specialties, Critical Care Units and the Institution at large. Approximately 4500 anaesthetics are administered per year for patients ranging from the neonate to the centurion. After the pre-operative assessment and optimization, safe, appropriate Anaesthesia is given and records are maintained of the same. Intra operatively patients undergo non invasive and invasive monitoring as per requirement. Early post operative pain is managed effectively by the Anaesthesiologists using various techniques like Thoracic, Lumbar epidurals, Caudal blocks, Peripheral Nerve blocks and Pediatrics Epidurals in addition to the usual IV & Rectal agents. Ventilatory and other support are given frequently in high risk patients. Anaesthesia is given for General Surgery and all other Allied Surgical Specialties including Cardiothoracic and Neuro Surgery. On the academic front the institution is accredited to the National Board of Examinations for DNB Anaesthesia. Regular Journal club meetings, case presentations and seminars are conducted for/by the DNB registrars. 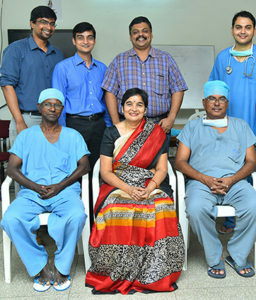 A pre-operative Anaesthesia Assessment Clinic from 9 a.m to 6 p.m every Monday to Saturday. Six fully equipped major operation theatres and 2 minor theatres. Securing the difficult airway in paediatric and adult patients using the Fibre optic Bronchoscope. Effective Post Operative Analgesia using continuous Epidurals, Caudals and Systemic routes. Post Operative Ventilatory and all other supports in a well equipped and staffed Post Op ward. Administering anaesthesia outside the operating room e.g. Cath Lab, ICU’s, Accident and Emergency ward. Palliative Care and Chronic Pain Management. The department takes pride in its staff and in having competent Anaesthesia Technicians in each operating theatre to assist the Anaesthesiologist in giving safe Anaesthesia and maintaining equipments. Multipara Monitors with Etco2 and invasive monitoring.